Turtles are reptiles, not amphibians. People often mistake them for amphibians due to the misunderstanding about the term amphibian. 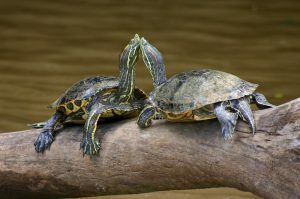 The word amphibian refers specifically to members of the class amphibia, but the word amphibious that comes from the same root means “operating or living on land and in water.” It is true that many turtles are amphibious, but none are actually amphibians. Yes, turtles belong to the class of cold-blooded animals called reptiles. In British English, a turtle is a type of reptile which either lives in the sea or in freshwater. If you’re a speaker of North American English, however, ‘turtle’ is a broader term: it refers to any reptile belonging to the order Testudines, including those that live on land (which British English speakers call tortoises or terrapins rather than turtles). The former name for the order Testudines was Chelonia, which is why all members of this order (turtles, tortoises, and terrapins) are known as chelonians. Reptiles have scales, whether they are large, small, rough, smooth, etc. This protective layer helps them conserve water and has also allowed them to spread across land in a way that amphibians are incapable of. Amphibians have smooth, soft skin that is incredibly porous and must hold moisture to help them breathe. Due to this, they must always stay close to a water source so their skin does not dry out. Reptiles have claws or nails, amphibians do not. Reptiles only breathe air through their lungs. Amphibians are born breathing with gills until they develop lungs later in life when they are older. Reptiles lay eggs that have a tough, leathery shell. Amphibian’s eggs are soft and need to be laid in water or in damp places. Class comprises types which live on land (snakes, lizards, tortoises); mainly in water (turtles); on both (crocodiles and alligators). No reptiles have an immature (larval) aquatic stage. Breathe by means of lungs. Lay eggs on land; eggs have shells. Class comprises frogs, toads, newts, salamanders, and caecilians: typically have an aquatic larval stage (e.g. tadpole) followed by a terrestrial adult stage. Breathe by means of gills (during larval stage) and lungs (during adult stage). Have smooth skin; adults use skin as secondary respiratory organ.